Ien has released a new template called 'Portal'. I'd say a simple yet attractive design and definitely one of the few good templates. 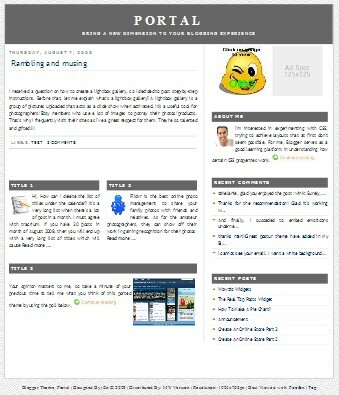 Alternatively, you can also customize the template to any concept or idea of your liking with some basic CSS editing. Click here to copy the script. Posted by Is | at 12:02 PM | Labels: Blogger Templates | Estou lendo: Theme name : PortalTweet this! | Feed. aiyoyo! malunyoor!! buruk sgt template tu huhu sob2!